IRAQ UPDATED AND STILL A MESS, BUT DIPLOMACY IS AT WORK AND MAJOR QUESTIONS! 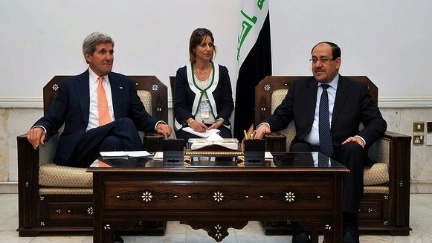 Secretary Kerry and Prime Minister Maliki met in Baghdad on June 23, 2014. The greatest challenge for American diplomacy in Iraq is finding a path that will contain the spread of sectarian warfare between Islam’s two dominant sects (the Sunni and the Shiite) and the intervention of their predominant co-religionist national entities. Already the Shiite state of Iran has offered military and financial support to Nouri al-Maliki and his exclusionary policy towards both the Kurds and the Sunni minority. Now Syria’s government seems to also be in support of Maliki, although still to an uncertain extent. Maliki made gestures towards a more inclusive government on Wednesday with Secretary Kerry, but Iran indicated it wanted America to stay out of Iraq. Thus, the direction of Iraq’s government and future remains in some doubt. To say the waters are muddy is an understatement and, clearly, the complexities boggle the mind as old foes become allies and vice versa. For America and the West in general, there are again no good options, and our current ones are limited in every direction. Unintended consequences loom everywhere. Diplomacy is trying now to bring some broader unity government to Iraq. At the same time, defeating ISIS gains without some element of military support seems to many to be tying our hands. The greatest danger for America is if it takes the side of one sect in this Islamic struggle or even being seen to do so. At the same time, though, the idea of a bloody ongoing global religious war and the establishment of an Islamic State of Iraq and Syria run under fanatical Islamic rule that spans from the shores of Lebanon to the heart of Iraq does, as Secretary Kerry has said, pose a long-term vital threat to America and our allies. The ISIS clearly poses a fundamental threat to the whole of Iraq. As their on-the-ground gains continue the scope for either a diplomatic or decent military solution become more and more questionable. Questionable yes, but probably not impossible, if the contesting powers and sects see beyond a wholesale tragic slaughter. The question of the day must be how to create solutions to what seems, by all accounts, an already disastrous situation. This solution, we have to remember, must be created with few good tools and a rising upheaval throughout the Arab world and beyond. In this context the question of what to do is without an easy answer, and the ramifications of any action is, without exception, open to many dangers and uncertainties. How do we deal with Maliki and his corrupt regime to truly help put together at this very late stage reconciliation between the contesting sides in Iraq? But, also, how do we dampen the trend of national proxies and Shia and Sunni countries which, in this volatile landscape, are in danger of being caught up and added to a region-wide chaos? For America the question must also be whether (and how) to apply American military assets in such a way that will not not cause even greater bloodshed? Having already sent up 300 military personnel and other assets to Iraq – but having done so with the problematic injunction that Maliki form an inclusive government with the Kurds and Sunni – we still must consider our other options. Does America have a constructive strategy for Iraq beyond trying to prevent a massive Sunni-Shiite conflict? Is it willing to commit its diplomatic, economic, and military support to this region? And at what cost and for how long? And, what will the Middle East and global environment look like without peacemaking efforts in a never-ending conflict? How far should America commit military assets without “boots on the ground,” to what objective, and for how long. And, how can it avoid “on the ground” blowback? What tools should be “usable” and not, and how should they be coordinated with the Iraqi government/military and with Iran? What role will/should Iran, the Gulf States and especially Saudi Arabia, Syria, Turkey, Lebanon, etc. play in this conflict? Will it be destructive and simply exacerbate the division between Sunni and Shiite? What can we do to make it constructive? Is the unified state of Iraq already lost? Is a break-up a better option or simply inevitable? What about a very loose federation? Can Maliki stay or must he leave? Would any alternative government be better? Do we need to accept, at this stage, a Maliki government? How far do we want to go to make him leave or promote a successor? What other tools of reconciliation, peacemaking, and peacekeeping can America and our allies and friends develop that will break the cycle of hate, raw ideological, religious, and ethnic conflict in the Middle East? I will not provide here and now my own answers to these questions, which I have addressed a bit in early posts. I do, rather, welcome the comments of others to provide their ideas and answers and proposals. So far the conversation is starkly divided. There is the sterile stance of some isolationists of “do nothing, let them kill each other” and there is the “neo-con” facile answer and oft-repeated argument of harsh military intervention. This is what got us into so much trouble earlier in Iraq, and the people who now want to go back massively into the bloody battlefield – blind as always to the realities of the landscape and its history – appear simpleminded. Our nation and the region deserve better examination and thought than either of these extremes. Again we welcome you comments! Next Article HAPPY FOURTH OF JULY, IT’S IRAQ AND SYRIA TOGETHER AND SPREADING LIKE MERS IN SAUDI ARABIA! We broke Iraq and the region with our invasion and occupation of Iraq and attempt to overthrow Assad in Syria. We cannot fix Iraq, Syria, or the region. The only things we should do are to stop intervening militarily, stop arming any side, pressure all sides to stop arming and aiding any side, and let those involved determine their own destiny. One result of the Vietnam and Iraq wars was the understandable distaste for American intervention in conflicts we did not understand and had no long-term strategic concept of how to win and how to end. But we also can’t be slaves to partial history and should learn from, but not be determined by, history which in each case is at many levels different. Iraq is not Vietnam, and Libya is not Egypt. Every challenge we have today is not a simple replica of past events. We should be informed by but not determined nor blind to the differences. Certainly, Iraq today has both similarities to the past but is very different. Not least is the tactics of the ISIS and the number of “players” in the ring and the breath and depth of this conflict and to some extent the next door upheavals in Syria which are equally complex and dangerous to the whole region. You mentioned that we broke Iraq and the region with our invasion and occupation. We also invaded Europe in WW I and much of its landscape was devastated and we messed up the peace negotiations, but we also came back and rightly “invaded” Europe again in WWII, and this time stayed, built new international institutions to keep the peace, and built a sustained recovery and a Europe that is largely at peace. We learned from our mistakes. We also acted with good results in what was Yugoslavia. I just came yesterday from a meeting with the Iraq Ambassador to the US, and he outlined a very serious situation – no surprise – but he said that America was Iraq’s preferred ally. It was clear from what he said (but more what he did not say) that outside helpful powers were needed. He also said things were so dangerous that Iraq would accept help from almost anyone…but would not make a pact or be allied to anyone. You say we can not fix Iraq and Syria…probably you are largely right if we are alone, but with the help of others in and outside the region there is at least a chance we might get this conflagration under some control. If we could I think we should try. It is like the recent story of a very sick man outside a DC fire company who asked for help. The firemen would not help because no one call 911! The man died. We and our allies are the Fire Company at the moment, and the case in the region is dire. The question before us is not “let’s stay out of the world” but, rather, to ask what are the challenges before us on this planet, what can we do, and how can we do it effectively and with the fewest risks. The problem we have today in America is not only the rise of a new Tea Party isolationism but also obstruction by their ideological blindness of support for paths of peacemaking and peacekeeping and diplomacy. Theirs is a denial of the importance of these “soft” tools, and of the impacts of the GOP’s decision to plow unnecessary funds into weapon systems that are unusable, ineffective, costly and aren’t even asked for by our military leaders. We are conducting diplomacy on a shoestring rather than with robust resources and adequate people including our USAID programs. My own view is that Secretary Kerry’s efforts are right and I am proud that America is trying through diplomacy to find some path to peace and reconciliation. Its decision to put on the ground some modest military eyes and ears and other assistance is probably just the right balance at the moment to provide some leverage over the events of the day. I thank you for your clearly heartfelt comments and please feel free to continue! I have no reason to keep Maliki in power………..just the opposite, as he appears to be as much the problem than a solution to the upheavals in that nation. But I do not want to see a bloodbath either in Iraq or in the region which is antithetical to American values and interests. And I do agree with President Obama that opening up a large area of the Middle East to the dominance of the ISIS which has demonstrated bloodthirstiness in killing civilians and imposed a harsh and cruel rule over the people and communities it has conquered. Further, it has amassed money and military resources that could and indeed would likely endanger our allies and threaten America and Americans. Again, given the complexities of these developments, it remains hard to discern what are our best options and likely outcomes. But the risks are high both in terms of spread of this war and wider sectarian conflict. Our humanitarian concerns also should have a high value and reason for seeking some kind of peacemaking intervention along the lines that Secretary Kerry is seeking. He is trying to get the cooperation of a broad range of states to help stop the killing and find a political solution. That is just the right role we should have now. I do agree that these are problems that are best solved by the Iraqis if they could, but recent failed internal efforts seem to indicate that some kind of outside help is needed. Mass murder has never been one of my favored outcomes of any upheaval. I sort of agree, as mass murder is clearly something to be avoided; but I cannot help wondering whether the U.S. can prevent mass murder (without sending in U.S. troops) or whether it is something only the Iraqis can resolve. Unfortunately, their solution to the problems of ethnic hatreds seems to be mass murder. Why is “do nothing. Let them kill each other” a “sterile stance”? We have no reason to care about such an outcome unless you think that preserving the Maliki government, which you have called “corrupt,” is somehow important to the safety of our 50 states. These are problems which are best solved by the Iraqis, not by us.